Free shipping. Buy direct from HP. 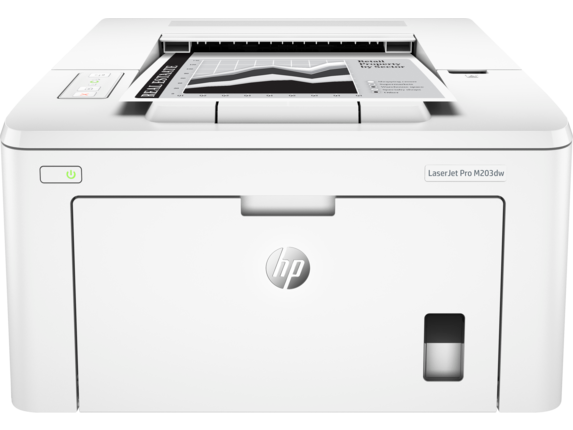 See customer reviews and comparisons for the HP LaserJet Pro M203dw Printer. Upgrades and savings on select products. Ideal for small businesses that want professional two-sided documents from a wireless printer that's easy to manage to help maximize efficiency. Get simple setup, and print and scan from your phone, with the HP Smart app.Easily print from a variety of smartphones and tablets.Print with the ease of sending an email, right from a smartphone, tablet, or notebook, using HP ePrint.HP Voice-activated printing—your HP printer works with Amazon Alexa, Google Assistant, Microsoft Cortana. 1 Based on ISO/IEC 19752 cartridge yields for HP 30A Black Original LaserJet Toner Cartridges compared with HP 83A Black Original LaserJet Toner Cartridges, and HP 30X High Yield Black Original LaserJet Toner Cartridges compared with HP 83X High Yield Black Original LaserJet Toner Cartridges. Learn more at http://www.hp.com/go/learnaboutsupplies 2 Mobile device must have iOS v7.0 or higher. Learn more at http://www.hp.com/go/mobileprinting 3 Mobile device needs to be connected directly to the signal of a Wi-Fi Direct® supported MFP or printer prior to printing. Depending on mobile device, an app or driver may also be required. For details, see http://www.hp.com/go/mobileprinting. Wi-Fi Direct is a registered trademark of Wi-Fi Alliance®. 4 Requires Google Cloud Print™ registration and Google account. Learn more at http://www.hp.com/go/mobileprinting 5 Requires Amazon Alexa, Google Assistant, or Microsoft Cortana and an HP web-connected printer registered with Google Cloud Print or ePrint. For ePrint account registration, see http://www.hp.com/go/support/eprint. 6 HP Auto-On/Auto-Off Technology capabilities are subject to printer and settings. 7 App or software and HP ePrint account registration may also be required. Some features require purchase of an optional accessory. Learn more at http://www.hp.com/go/mobileprinting 8 Printer requires ePrint account registration. App or software may be required. Learn more at http://www.hp.com/go/mobileprinting 9 For details on local printing requirements see http://hp.com/go/mobile printing. 10 Based on HP internal research on competitor offerings (Device Security Comparison 1/2015) and Solutions Report on HP JetAdvantage Security Manager 2.1 from Buyers Lab, 2/2015. Requires separate purchase. For details, see http://www.hp.com/go/securitymanager 11 Comparison based on ISO 24711 cartridge yields for HP 30X High Yield Black Original LaserJet Toner Cartridges compared with HP 30A Black Original LaserJet Toner Cartridges. Learn more at http://www.hp.com/go/learnaboutsupplies. 12 As compared with cartridge gauges for HP predecessor products. Take the performance of your printer to the next level with the stellar 30 page per minute capabilities of the HP LaserJet Pro M203dw. Efficient two-sided printing and a 250 sheet paper input tray make this the powerhouse you’ve been looking for to get bulky printing jobs done faster. Powered by JetIntelligence toner cartridges, the HP M203dw delivers crisp text and sharp lines so you never sacrifice quality for quantity. Print twice as many pages when you opt for Original HP high yield toner cartridges. These ensure your documents are held to the same HP quality standard while getting more bang for your buck. Print high quality documents with a few simple taps when you send your print jobs from your mobile device to the HP LaserJet Pro M203dw. Use the HP ePrint app to create orders straight from your smartphone, tablet, or notebook. Google Cloud Print™ 2.0 and AirPrintⓇ are also compatible with this exceptional printer. No matter what mobile device you use for your on-the-go printing needs, a built in gigabit Ethernet connection ensures your documents get sent to the print queue as quickly as possible. If you’re managing an entire fleet of printers in your office, take advantage of the centralized control center of the HP Web JetAdmin program. This innovative software lets you identify new printers with ease and configure remote monitoring so you can keep your print jobs organized and efficient. Protect sensitive business data and secure your fleet with the added benefit of the HP JetAdvantage Security Manager. As the most comprehensive printing security program on the market, you’ll be able to instate a single security protocol that ensures all devices follow the same accessibility and delivery standards. Concerned about overloading your building’s power grid with large print jobs? 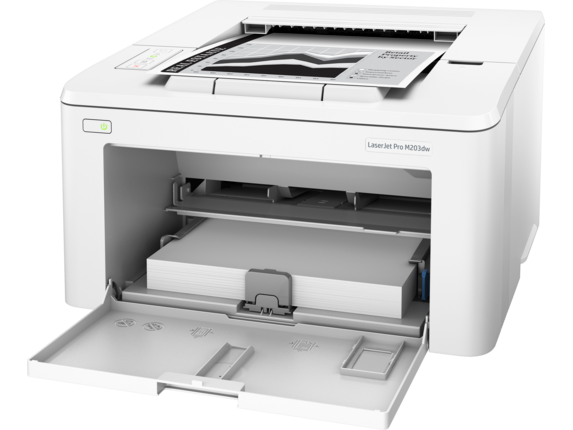 The HP LaserJet Pro M203dw is ENERGY STARⓇ qualified and meets the silver standard for EPEATⓇ. For an energy-saving bonus, HP Auto-On/Auto-Off technology ensures your printer will never idly waste electricity when you aren’t using it. 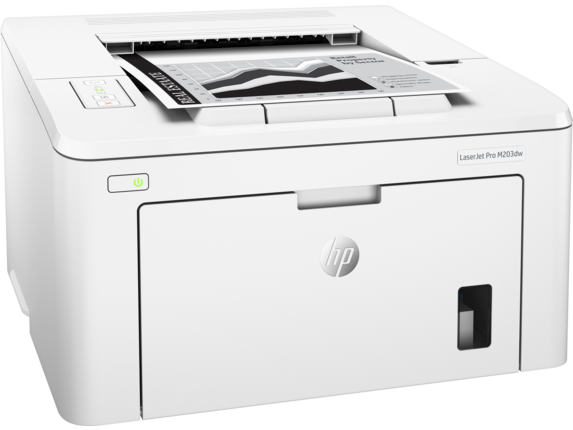 The HP LaserJet Pro M203dw only prints in black and white, making it the ideal printer for a fast-paced business or college classroom setting. A resolution of 1200 x 1200 dpi and 800 MHz processing speed delivers exceptionally sharp prints that are effortlessly transferred onto paper, envelopes, labels, cardstock, and postcards. Searching for a similar printer that also offers color printing? Take a look at our HP LaserJet Pro Color Printers to get lab-quality prints that perfectly capture each pixel. 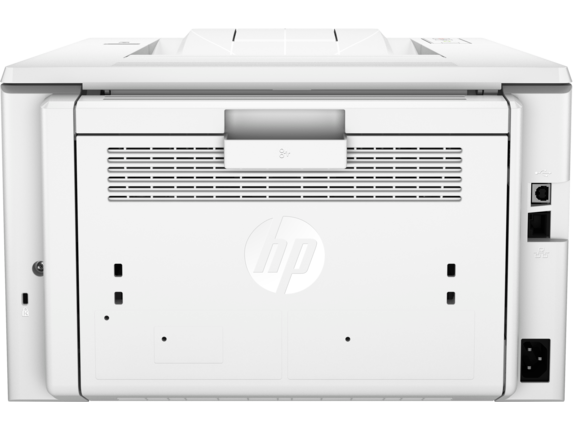 The HP LaserJet M203dw comes with a standard 1 year limited warranty, with easy options for a two or three-year extended warranty.